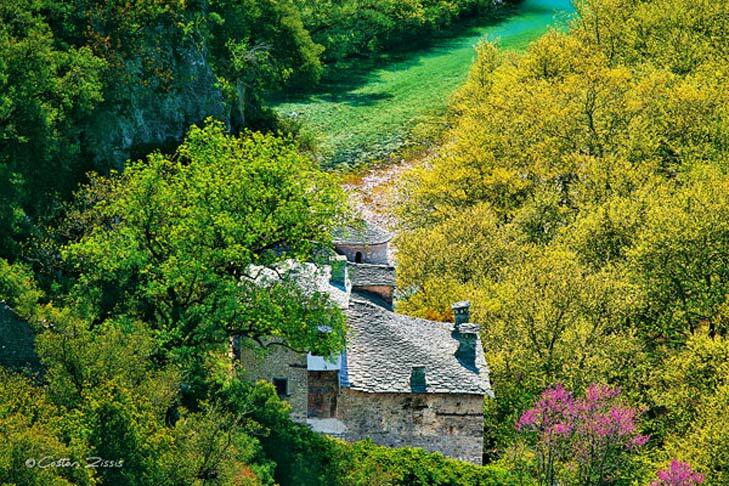 The sights and monuments one can explore in Zagori are countless. Our hotel offers to all our customers who have a Google account, a custom made map in the Google Maps platform. It is enriched with a diverse amount of information as well as points of interests in the area and offers navigation capabilities for a smartphone or a tablet. The map was customised and is continuously updated by local photographer Costas Zissis. It was built in 1579 or, according to different sources, in 1665 by Ioakeim and Sophronios the monks and it was wall-painted by the monk named Parthenios in 1673. Panagia Speleotissa, Our-Lady-in-Caves, was a wealthy institution during the Ottoman Rule, owner of a great land area and thousands of animal stock. It was supported by whole villages of workers and it played a very important role in Aristi and the nearby villages, through philanthropic activities, funding of schools, etc. 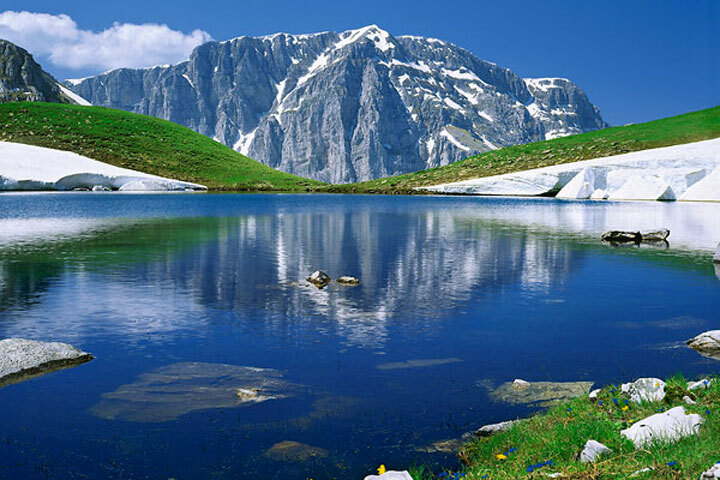 Drakolimni, the Dragon’s Lake, is located in Mt. Tymphe, at an altitude of 2.100 m in a magnificent natural landscape and is a popular hiking destination. The alpine lake keeps its waters throughout the year and its special feature is the alpine triton (Triturus alpestris), a rare amphibian species resembling a miniature dragon. The lake can be reached after a 4 hours hike from the village of Mikro Papingo and is an hour away from the well-organized Astraka Refuge. It was built in 1853 and is well preserved until now. 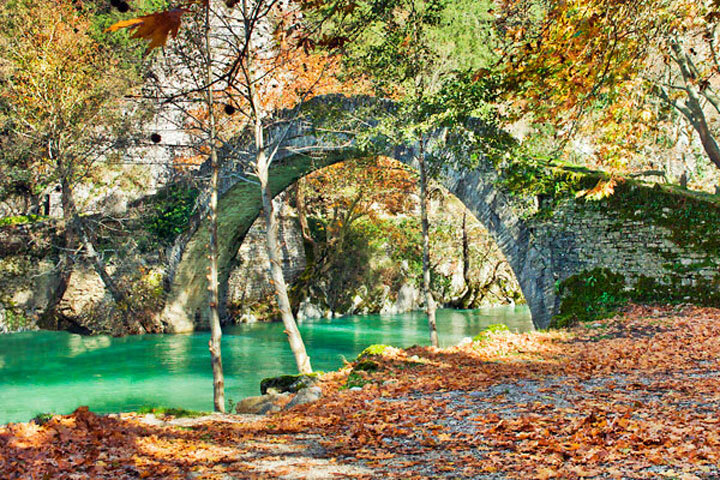 It is located in the village of Kato Kleidonia and bridges the Voidomatis River. 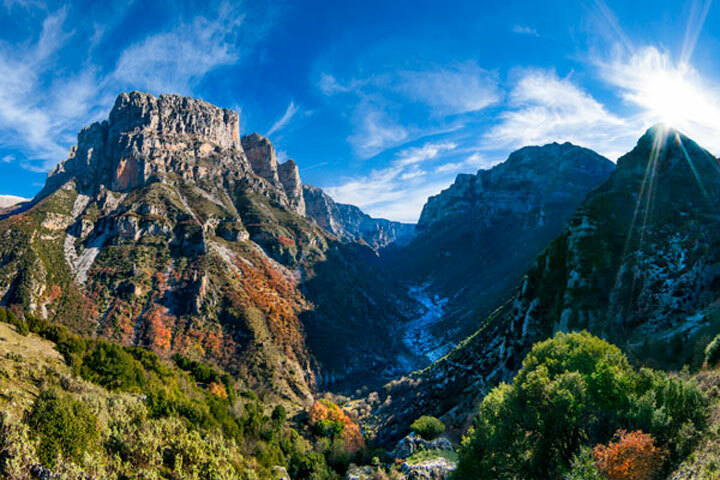 In older times served those who travelled from West Zagori to Konitsa. 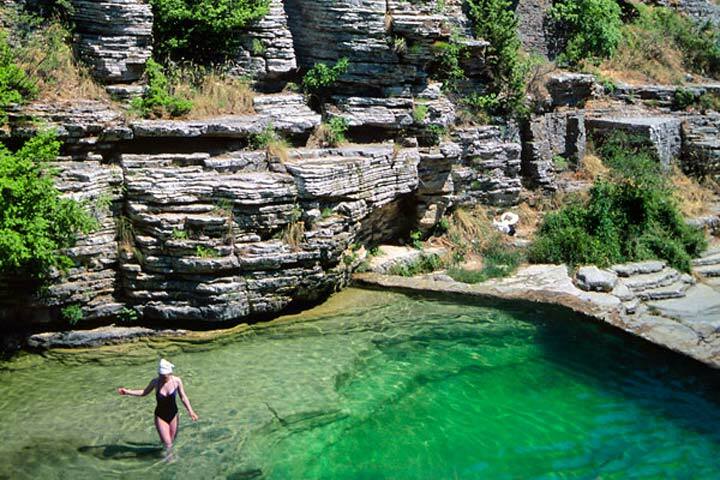 It crosses the Central and Western Zagori all the way through Kipi village and and up to the village of Vikos. 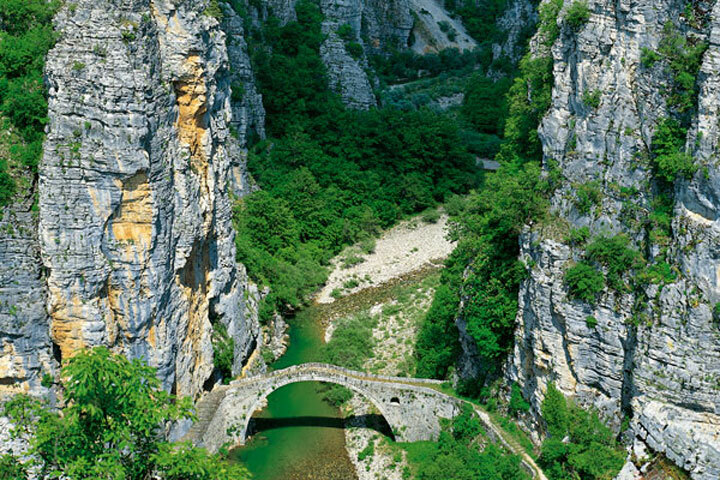 The length of its main section is about 14 km and is considered as the deepest European canyon. Its width varies from 500 to 2000 meters and its depth from 550 up to 1200 meters. These are hollows in limestone rocks, created by the erosion of the Rongovo stream waters, between the villages of Mikro and Megalo Papingo. Taking profit of this natural phenomenon, locals blocked the two largest ones, transferring them into, running, clear water pools. Kalogeriko or Plakidas, is a three-arched bridge, built in 1814. There was a wooden structure in place initially, but thanks to the sponsorship of the Seraphim the monk of the Kipi village monastery it was finally built in its present form. In 1865 the bridge was restored by Alexis Plakidas. 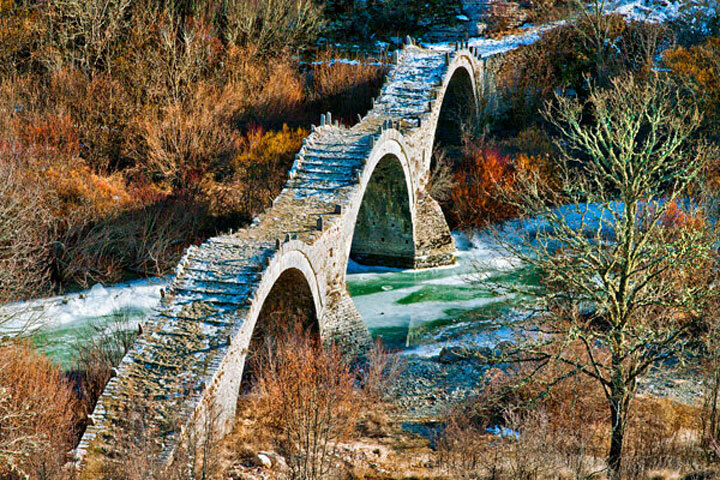 The construction of the bridge was sponsored by Noutsos Kontodimos from Vradeto at around 1750. Many were those who participated in restorations of the bridge through time, such as the miller Gregorios Kokkoris from Koukouli who sponsored it in 1910. It was constructed in the early 18th century to link the villages of Vradeto and Kapesovo, covering an altitude difference of 250m. 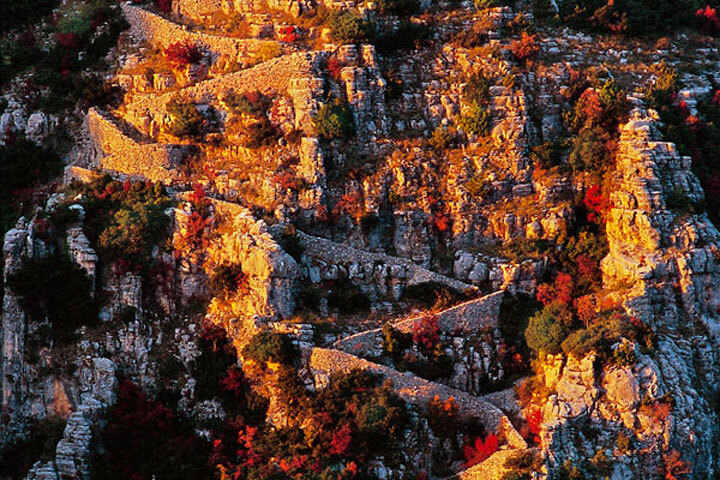 Its length is 1500m; it is built of 1100 steps and attracts numerous hikers.